Yesterday was one of Tokyo’s biggest festivals. The 深川八幡祭り (Fukagawa-Hachiman Festival). Were you there? I was there, but not as a spectator. I have been a member of a group in this festival for nine years. I’m one of the people carrying a 神輿 (portable shrine) in this festival. This festival isn’t held annually like most festivals. It’s held every three years. So the next time will be in August 2017. 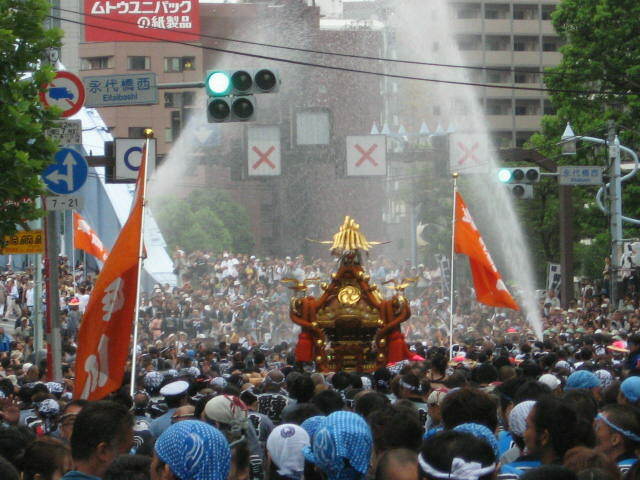 It’s often called 「水かけ祭り」 ( the “Water-throwing Festival” ) because spectators throw buckets of water on the participants. And even the Tokyo Fire Department sprays us with firehoses! I wrote a post the last few times I’ve participated in this festival. The last time, the Emperor and Empress of Japan attended the festival! Click here to see that post with photos. It was a rare opportunity that we were able to see the royal couple so close! Here are a few of the excellent photos that my wife took. Today is 「終戦記念日」 (lit. “Anniversary of the end of the war”), or, as it’s referred to in the West, VJ Day. So today is the 65th anniversary of the end of World War 2. Unfortunately it’s not the anniversary of war completely. I’m not going to write a lot of this today because last year I wrote a post about the 64th anniversary that included an English translation of part of the Japanese Emperor’s speech to the people of Japan (click here to read it). And the year before, I wrote a post about the 63rd anniversary that explained a bit about 「靖国神社」 (Yasukuni Shrine) and it’s relevance to this day. (click here to read that post). This year 「終戦記念日」 (VJ Day) is on a Sunday (today), so I’m sure 「靖国神社」 (Yasukuni Shrine) was crowded today. Also today was the last day of this year’s 「深川八幡祭り」 (Fukagawa Hachiman Festival)…also called the 「水かけ祭り」 (“Water Tossing Festival“) because people watching the festival throw water on the people carrying the 神輿 (Miskoshi portable shrines). Even firefighters hose them down. Two years ago I participated in this festival by helping to carry a 神輿 (portable shrine). It was fun…but carrying that heavy thing all day and also tossing it up and catching it many times…my arms and legs were aching the next day! This festival occurs every August in the 門前仲町 (Monzen-Nakachou) area of Tokyo…but the big main festival only occurs every three years. When I participated two years ago it was a “big, main festival”…and next year when the big festival is scheduled again, I am invited to join again. Click here to see photos and videos of this festival from two years ago when I was a member of one of the 神輿 (Miskoshi portable shrines) teams. 「ようこそジャパン」 (Yokoso Japan!) means “Welcome to Japan!“, and is the Japan National Tourism Organization‘s official slogan of their campaign to attract foreign visitors to Japan. 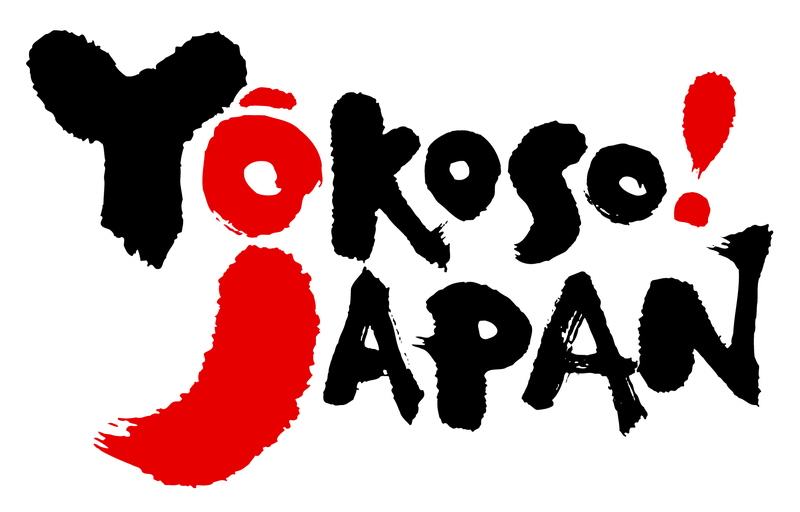 Here are some of their Yokoso Japan! campaign ads. Do they make you want to visit this beautiful country? I was looking at the pictures on my 携帯電話 (Cell-phone) camera. Yesterday was the day for the annual 深川八幡祭り (Fukagawa-Hachiman Festival). Not only that, it was also the big, full festival that occurs every three years! You can read a little more about this festival on my Festivals page by Clicking here. I didn’t mention it before but two years ago I was invited to participate in this year’s festival. I carried a 神輿 (portable shrine) in this festival nine years ago…and the next day, I swore that I’d never do it again! It was a unique, fun experience…but my body ached so bad that I decided that I only wanted to experience 神輿 (portable shrine) festivals as a spectator from then on. But carrying a 神輿 (portable shrine) can be compared to drinking in excess…you enjoy it while you’re doing it, but the next day you’re in pain and tell yourself that you’ll never do that again. But when the memory of the pain fades, you’ll happily agree to join in again! That’s what happened in 2006 when I was invited to join in the 2008 festival. I gladly agreed. I’m not saying that I regret my decision. Not at all. My muscles ache…but it’s not so bad. And I really enjoyed it. At the end of yesterday’s festival, I was invited to join in the next big, full version of the festival again in 2011! I agreed again. Anyways, yesterday, I got to the meeting place at 7:30AM and changed into the clothes worn by 神輿 (portable shrine) carriers. This festival is centuries old and little has changed…including the clothes. There are over 50 神輿 (portable shrine) carried by different groups in this festival. Each group wears a different 反転 (light jacket). At 8:00 our leader gave us a few encouraging words and then we picked up our 神輿 (portable shrine) and it began! Each group has about 70 people (I’d estimate) and only 30 or so can fit around the 神輿 (portable shrine) at a time. So the remaining people who aren’t actually carrying it follow behind and change out with the carriers as they become tired. What makes this festival different from most 神輿 (portable shrine) festivals is that the people in the crowd throw water on the people carrying the 神輿 (portable shrines)! Many people stand in trucks with the beds full of water and use buckets to throw the water, some people use garden hoses…and the Tokyo Volunteer Fire Department was there—spraying us with fire hoses! At noon, we put the 神輿 (portable shrine) down and all of us (nearly 4000 people, I guess) were given お弁当 (Japanese box lunches). At that point, we were pretty sore…and cold. Usually getting soaked is a blessing for the people carrying the 神輿 (portable shrines) at this festival since August in Tokyo is sweltering. And it has been extremely hot every day this month…but the day before this festival, there was a storm in Tokyo and I guess it brought a bit of a cold-front. In addition, it was overcast all day. But we weren’t done yet…only halfway. After lunch, it began to lightly rain. Noone would’ve noticed since we were already very wet. But that didn’t make the weather any warmer. At the end, we didn’t just put the 神輿 (portable shrine) away. It was done extravagantly! Turning around and around, throwing it up and catching it. 神輿 (portable shrine) aren’t light…about 2 tons!) with lots of water being sprayed at us! I enjoyed it alot! And I’ll be back for more in 2011! It was over at 5:30PM…over nine hours! We were given some beer and we had a toast to our success. Since I was busy carrying the 神輿 (portable shrine) and getting soaked, my wife took all of the photos and videos! She took some excellent pictures and videos! Better than I do. I just finished my Festivals In Tokyo page. You can click the link at the top of this page…or click here to see it. The day before yesterday, I had to go up to Saitama for a few hours. 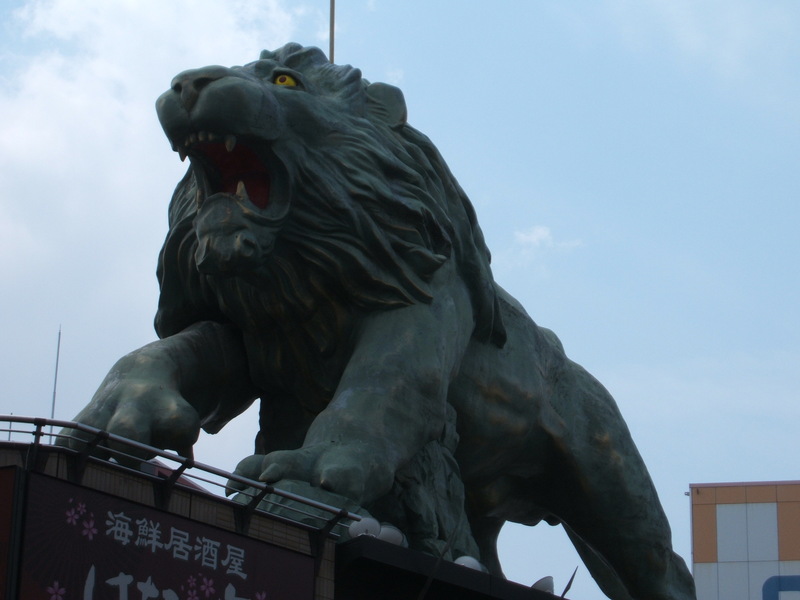 Do you know what station this lion statue is near? Then, that evening, I met my family at the 靖国神社 (Yasukuni Shrine) for the annual みたま祭 (Mitama Festival). This festival takes place during お盆 (O-bon) (click here to read my FAQ about O-bon). Most of Japan has Obon in August…but it’s often celebrated in July in Tokyo. 青森県 (Aomori Prefecture) in Northern Japan has a cool festival called ねぶた祭り (Nebuta Festival). At the Mitama Festival in Tokyo, a group of Nebuta Festival dancers come and do a show. How are Japanese schools different from America's?